"Amazing grace, how sweet the sound, that saved a wretch like me. I once was lost, but now I am found. Was blind but now I see". It’s this hymn that I sing to my daughter when she is often having trouble sleeping, and each and every time I am reminded that by birthing her into the world I was given an embodied understanding of grace, and through the passage of motherhood shown the true meaning of grace. Our pathway into grace is unique for each of us. But the defining connection to it is our intention and the depth of our desire to drop into a stage of grace. Grace is a state of surrender. When we come into a state of grace we are at one with our true selves. We are open to feel the presence of something greater than us. How do we experience grace? We must be open to receive it’s gifts. The partner state to grace is that of gratitude. Gratitude for ALL that life has to offer us, the good and the bad, the lessons and the light. Gratitude for the gift of our life, of our bodies, of each and everyday we are privileged toto experience all it’s riches. Grace effortlessly unfolds when we release our attachment to our identities. The identities we carve out for ourselves. From a body consciousness perspective the hips are where we house our identities of ourselves. As a teacher and healer I see so much tightness in the hips, we hold so much confusion around our souls true identity, because we layer it so tightly with our stories of who we are. As young children we start to forget who we truly are, and we become what we expect others want us to be. We behave in ways that we think our parents, teachers and siblings want us to, and we mistake our behaviours with our identity. We loose connection with our source and our unique imprint. 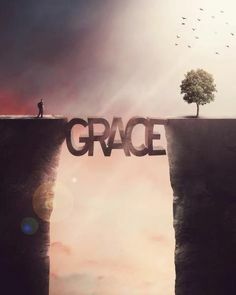 But it's always there, and grace can appear to reconnect you to your true nature, should you set your intention to do so. Grace gives way to the understanding of our oneness, about the interconnectedness of our eternal energy to that of another, and of the energetic surrounds we life in, our nature body. The mirroring of great sources of energy within our atmospheric surrounds reside also within each of us. We are of nature, we are strong like the sun, moveable like the wind, we come from the earth and re-enter the earth in a wondrous cycle of life. Look to nature if you wish to find grace. We are gloriously bathed in it. Just as nature is wild and sometimes fierce, as can be our lives, and the relentlessness of our thoughts. But just as in nature, there are rhythms and cycles, and moments of calm for us to come into peace. When your are in the eye of the storm, being rolled deep into the ocean by relentless waves of experiences, always remember, it will pass, transform, become anew if we choose for it to do so. Throughout all of this shifting energy is this greater presence of grace and love. At the heart of all of our experiences, "good", "bad" or however we label them to be, is love. Love guiding us through into the depths of where we dare to go, to complete the assignment of our souls evolution in this lifetime. We are only ever given what we can handle, and what we asked to learn before we entered our physical bodies in this lifetime. You are safe, your are loved, you are bathed in Grace. When we come into a state of grace in our body, through physical practices such as yoga, we are opening a divine portal to the invitation to connect to our own version of grace. The embodiment of our thoughts, energetic patterns, can be gently guided back into the sense of wholeness and perfection that sits within us eternally. So many of us have forgotten our state of perfection, because we’ve drowned it out with thoughts, of “not good enough”. You are. You are perfect. Artfully and majestically, grace appears for us right at the moment we need it most. Grace it the bridge from despair to hope. In the darkest of hours, when nothing seems to make sense anymore. Grace, in some form will be your saviour. All we need to do is ask, and it will arrive in the form of a thought, an idea, a moment of inspiration, a sign, the look on a child’s face, the breeze of the wind through the trees. Grace will be served up to you by the universe in the form that is just the right form of medicine for you. My sincere desire is that you can be guided to connect to the grace that is within and around you, of which you are part. Just like Dorothy in the Wizard of Oz, all we need is a reminder that it’s all within you, and to come home to you. Older PostDefine to me success.